← CowParade North Carolina 2012 Is Here! Paperhand Puppet Intervention “City of Frogs” Giant Puppet Pageant! 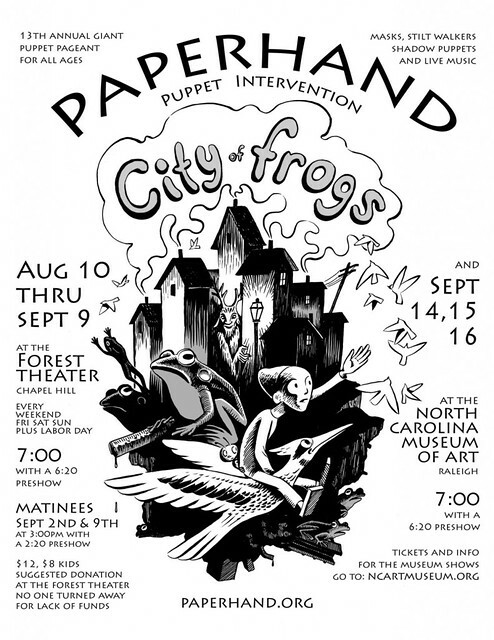 City of Frogs runs August 10th thru September 9th at the Forest Theatre in Chapel Hill with performances every Friday, Saturday, Sunday and Labor Day at 7:00. Matinee shows will be held September 2nd and 9th at 3:00. Tickets are General Admission at the door for a suggested donation of $12 for adults and $8 for children, 2 and under get in free. Additional performances can be seen atthe North Carolina Museum of Art September 14, 15 & 16. Tickets forthese performances can be purchased online at www.ncartmuseum.org. Both venues have pre-show performances each night at 6:20 from local bands and musicians. Matinee pre-shows are at 2:20. 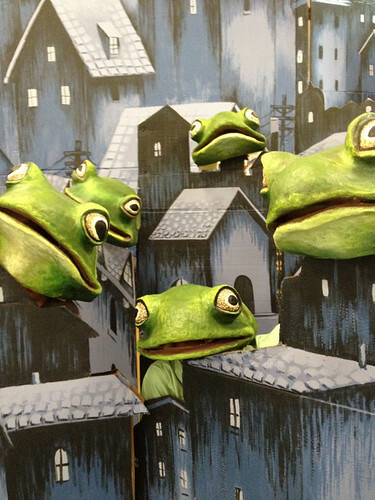 City of Frogs weaves together folktales and myths into a modern fable of a wooden boy seeking to find what itmeans to be alive. Along his journey the boy meets a menagerie of oddcharacters: a junk collector who seeslife in garbage, an ancient witch who has lived so long the forest hastransformed around her, a golem of mud who stops to listen whenever music isbeing played, and so many more. For months leading up to opening night the Paperhand studio is a busy hive of creation. Together with apprentices, andupwards of a hundred volunteers, Burger and co-founder Donovan Zimmerman bringthe puppets to life. “Paperhand has evolved with the help of our community and friends. Our vision has become grander than it ever could otherwise. We couldn’t do it without them.” Says Zimmerman. 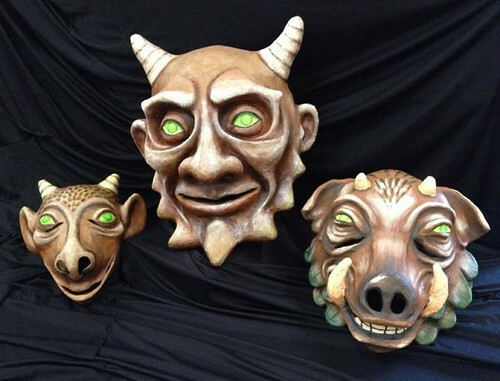 Paperhand Puppet Intervention was born from the creative collaboration of Jan Burger and Donovan Zimmerman in 1999. Their vision isinspired by their love for the earth and its creatures as well as their belief in justice, equality and peace. Paperhand’s mission is to produce workthat inspires people, promotes social change, and is deeply satisfying for everyone involved. 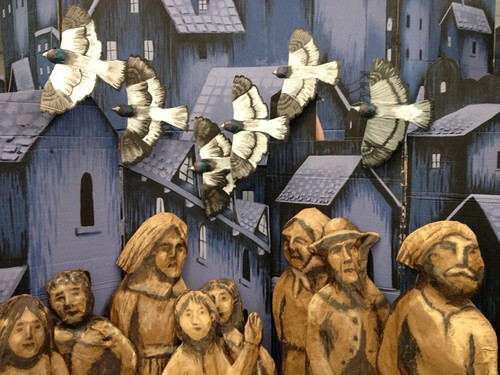 The puppet shows they create are a synthesis of manyartists and art forms including, but not limited to: sculpting, painting,music, dance, improvisation, costume/set design and theater. To find out more about the show, theopening acts, volunteer opportunities and sneak peeks behind the scenes visit www.paperhand.org.